Today's card uses a stamp from the set A Little Treat, which is really designed to be used with the Sweet Treat cups which you add to a card and put lollies or other yummy goodies inside. This card is another one designed by the talented Tamara Conroy, and is one we made at one of our monthly get-togethers. 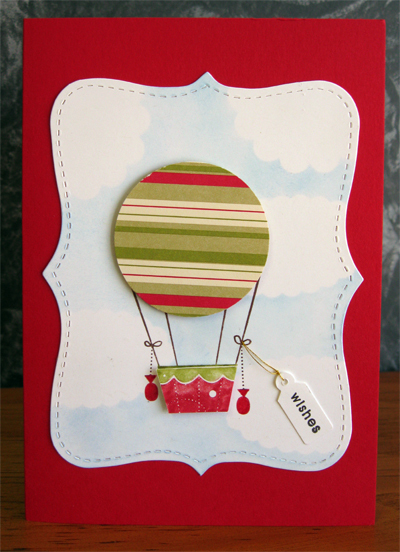 The stamp is inked using Stampin Up's brush markers directly on to the rubber, to give the different colours. 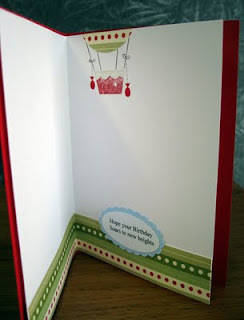 I also love the finishing touches to the inside of the card. A shape cut with the Top Note Die in the Big Shot used on the front of the card, and the clouds are created by cutting masks with the scalloped oval and circle punches, and sponging around them with Bashful Blue ink. 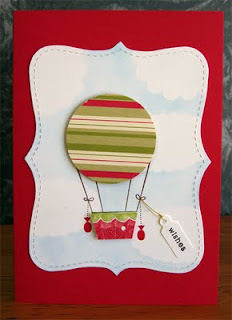 If you would like to order any of the supplies used to make this card, please email me.